Stephanie is a hard worker when it comes to her professional responsibilities. Pushing through the day, she makes sure she gets done what she’s expected to, often more. Sitting late at work, pulling an all-nighter, missing personal obligations for professional commitments is all too common an experience for her. And all the important family commitments that she has missed is an entirely different story on its own. But all this is now taking a toll on her health (both mental and physical), and her productivity. So, what exactly is missing from her life? You guessed it – Eisenhower Matrix. Often times, you may not realize it but the only thing you need in your life is a little bit of organization and prioritization of what needs to be done to fulfill the overlapping commitments. With that being said, you’re probably thinking it’s not that difficult after all. You’re wrong and right at the same time. Wrong in a way that if you think just randomly making a to-do list is going to work wonders for you, it will work, but not in a mind-blowing way. And you’re right, with a little bit more effort and by using Eisenhower Matrix, your life will get a whole lot better. Eisenhower Matrix is a method of prioritizing your tasks on the basis of their urgency. It helps to determine the activities which are important and the ones which do not deserve your attention at all. The brainchild behind the famous Eisenhower Matrix is Dwight D. Eisenhower. This quote sets the basis for Dwight’s personal time management too. Coming towards the matrix, the matrix basically categorizes your tasks into 4 quadrants according to what you need to do at a particular time during your day. The first quadrant of the Eisenhower Matrix, Do, consists of your most important tasks. The activities which need to be done urgently. The tasks with a deadline approaching or the ones that cannot be delayed generally fall in this category. For putting tasks in this category, you need to thoroughly analyze your priorities first and then decide if it fits with the do it now criteria. If the task needs to be done within a day, or no longer than next day, it is an urgent task. Do.it.now! Another way to put this in context is to keep in mind the famous ‘eat the frog first principle’ of Mark Twain, connotating that you should do your most urgent tasks for the day the first thing in the morning. Let’s take a concrete work example here to make things easy for you. At the end of each week, you’re delegated with the responsibility of providing a comprehensive report to your manager. Now, your week ends on Friday. It’s Thursday morning already and you haven’t prepared the report. Does this classify as an urgent task? Absolutely! The 2nd quadrant of the Eisenhower Matrix is Decide. It constitutes of the tasks which are important, but not necessarily urgent. This could include an array of responsibilities ranging from professional emails, follow-ups, to more personal appointments and commitments. Tasks in this quadrant need to be scheduled for some other time. Generally, these tasks are in line with your long-term goals and contribute towards your growth. A common everyday example could be to exercise. You know it’s crucial to good health, but you cannot dedicate time to it. So, you need to decide the time when you’re ready to hit it. Schedule tasks in way that they do not transfer into the ‘urgent’ category. Make sure you have enough time to execute them while they still fit in this division. 3rd quadrant of the Eisenhower Matrix is Delegate. This category refers to the tasks which are not important, but urgent. Although it sounds counter-intuitive, because naturally your first instinct would be that aren’t tasks which are urgent, important too? Not necessarily! These activities generally give you the deception of being important, while in reality they don’t really contribute much towards your productivity. You need to decide whether you need to reschedule it or if someone else can do it for you. Some of the examples can include scheduling interviews, replying to certain emails, or team meetings that can be conducted by someone else, while you’re busy executing your quadrant 1 activities. The last category of Eisenhower Matrix is Eliminate. These consists of tasks that are essentially your productivity killers. They do not contribute at all towards your goals. Identify these activities and eliminate them to give your productivity a boost. Common examples of these activities include mindless surfing on social media, constantly checking your phone for calls or messages, playing video games, or general activities that you use to procrastinate. If by now you’re wondering your life will magically become organized by using this matrix, it’s not that easy! But by putting in a little bit of effort, you can get yourself on track. First things first, you need to classify your urgent and important activities. For doing so, you need to set your priorities right and define urgency levels. Your urgent tasks are usually the ones which have a time constraint attached to them. These activities have a ‘do it now’ written all over them and require your utmost attention. On the other hand, your important tasks are generally long term and rather goal-oriented. Generally, they don’t give you immediate results and are more focused towards making better long-term decisions. Assign color codes to your quadrants to quickly help you understand the gravity of the situation. By allocating colors, you can get a quick glance at what needs to be done next. These color codes also help you to prioritize your tasks to make informed decisions. For example; the do quadrant can be colored red to indicate the urgency of tasks. To avoid over-lapping commitments, make separate matrices for your professional and personal tasks. This will steer you clear for what lies ahead and will greatly influence how you manage your time. A trick here can be to dedicate distinct hours of the day for both kinds of commitments and see how that works for you. Adding too many items per quadrant will over-complicate things and the purpose of using Eisenhower matrix for time management will be lost. To optimize it, limit the number of actions to 7 or 8. That way you won’t be over-whelmed with what you need to do. Let’s just admit the fact that if you don’t opt for professional tools for time management, you’re missing out on a lot. 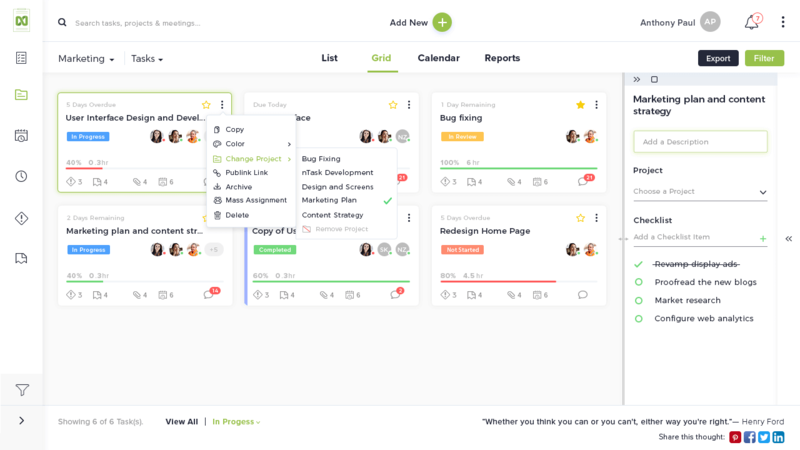 For this matrix to work like a magic wand, you need a project management tool. At this juncture, let us introduce you to nTask. So, what are you waiting for? Use the Eisenhower matrix now and maximize your productivity now. Let us know how it works for you.